"Italo-Western" redirects here. For the film genre, see Spaghetti Western. Italo-Western is, in some classifications, the largest branch of the Romance languages. It comprises two of the branches of Romance languages: Italo-Dalmatian and Western Romance. It excludes the Sardinian language and Eastern Romance. Based on mutual intelligibility, Dalby lists four languages: Corsican, Tuscan and Italian, Napolitan–Sicilian, and Dalmatian. The Dalmatian language was spoken in the Dalmatia region of Croatia. It became extinct in the 19th century. The Istriot, spoken on the Istrian peninsula of Croatia, Slovenia, and Italy. The Tuscan language is mainly spoken in Tuscany, Italy. The Corsican language is related to Tuscan and has the dialects of Gallurese and Sassarese. The Italian language, is the closest to Latin of the Romance languages. Italian is an official language in Italy, Switzerland, San Marino, Vatican City and western Istria (in Slovenia and Croatia). It used to have official status in Albania, Malta and Monaco, where it is still widely spoken, as well as in former Italian East Africa and Italian North Africa regions where it plays a significant role in various sectors. Italian is also spoken by large expatriate communities in the Americas and Australia. Italian has been primarily based on Tuscan, specifically on its Florentine variety and later deeply influenced by almost all regional languages of Italy while its received pronunciation (known as Pronuncia Fiorentina Emendata, Amended Florentine Pronunciation) is based on the accent of Romanesco (Roman dialect); these are the reasons why Italian differs significantly from Tuscan. The Central Italian languages, or Latin-Umbrian-Marchegian, include the varieties of Romanesco and Marchigiano. Neapolitan language is spoken in Southern Italy. The Campanian dialect is spoken in the southern part of Lazio and in the region of Campania. The Sicilian language is spoken in Sicily; central and southern Calabria; in Roccagloriosa and Rofrano; and in the Salento peninsula of southern Apulia. The Venetian language is sometimes added to Italo-Dalmatian when it is excluded from Gallo-Italic, and then usually grouped with Istriot. Judeo-Italian languages are varieties of Italian used by Jewish communities, between the 10th and the 20th centuries, in Italy, Corfu and Zante. Based on mutual intelligibility, Dalby lists a dozen languages: Portuguese, Spanish, Asturian-Leonese, Aragonese, Catalan, Gascon, Provençal, Gallo-Wallon, French, Franco-Provençal, Romansh, and Ladin. The Langues d'oïl, or Oïl languages. These include Standard French, Picard, Walloon, Lorrain and Norman. The Arpitan language, also known as Franco-Provençal. It shares features of both French and the Provençal dialect of Occitan. Sometimes included in the Oïl languages. The Rhaeto-Romance languages. They include Romansh of Switzerland, Ladin of the Dolomites area, Friulian of Friuli. 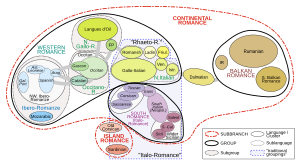 Rhaeto-Romance languages can be classified as Gallo-Romance, or as an independent branch of the Western Romance languages. The Occitano-Romance languages of Southern France and East Iberia, includes Occitan and Catalan. Occitano-Romance languages can be classified as Gallo-Romance, Iberian-Romance, or as an independent branch of the Western Romance languages. The Catalan language has standard forms of Catalan and Valencian. Can be classified as East Iberian. The Gallo-Italic languages. They include Piedmontese, Ligurian, Lombard, Emiliano-Romagnolo, Gallo-Italic of Sicily and Gallo-Italic of Basilicata. Gallo-Italic languages can be classified as Gallo-Romance or as Northern Italian dialects. The Venetian language is sometimes included in Gallo-Italic, but it has several characteristics that set it apart from it. The Oïl languages, Arpitan and Rhaeto-Romance languages are sometimes called Gallo-Rhaetian. The Castilian languages: includes Spanish and Judaeo-Spanish. The Galician-Portuguese languages: includes Portuguese, Galician, Fala and Uruguayan Portuñol. The Astur-Leonese languages: they are, from east to west, Cantabrian, central-eastern Asturian and Leonese proper. Going from north to south, they are Leonese proper, Mirandese, Extremaduran and Barranquenho. The Pyrenean–Mozarabic languages: includes Aragonese, and the extinct Mozarabic. Can be classified as West Iberian. The East Iberian language, or Catalan language: usually classified as part of Occitano-Romance, see Gallo-Romance above. ^ Hammarström, Harald; Forkel, Robert; Haspelmath, Martin, eds. (2017). "Italo–Western Romance". Glottolog 3.0. Jena, Germany: Max Planck Institute for the Science of Human History. ^ a b David Dalby, 1999/2000, The Linguasphere register of the world's languages and speech communities. Observatoire Linguistique, Linguasphere Press. Volume 2. Oxford. This page was last edited on 29 June 2018, at 19:08 (UTC).